A thick and intense apple flavoured ‘butter’ with cinnamon spice! Homemade apple butter is the best! That thick ‘butter’ like consistency apple sauce spread all over some cinnamon toast in the morning is simply amazing! 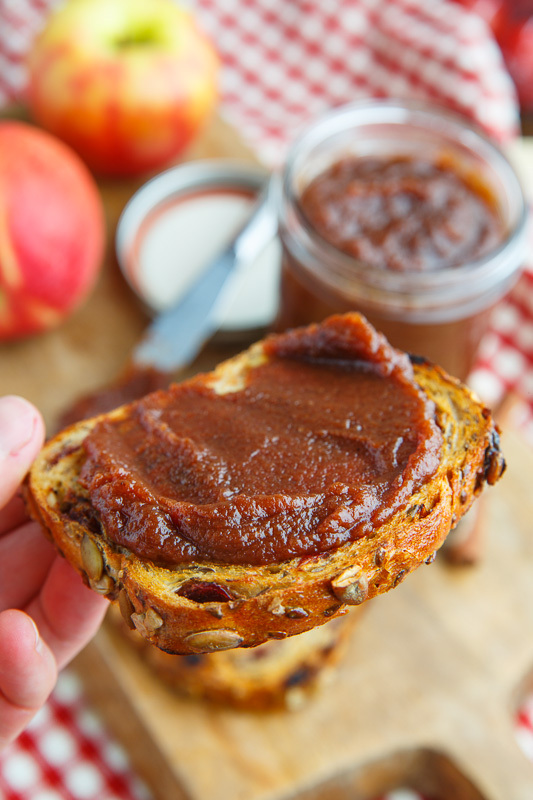 Apple butter is basically an apple sauce that is reduced to a thick butter like consistency so that it can be spread, like butter, on things like toast, bagels, pancakes, waffles, etc. The apple flavour is concentrated as the apples are reduced and this really intensifies the apple flavour! 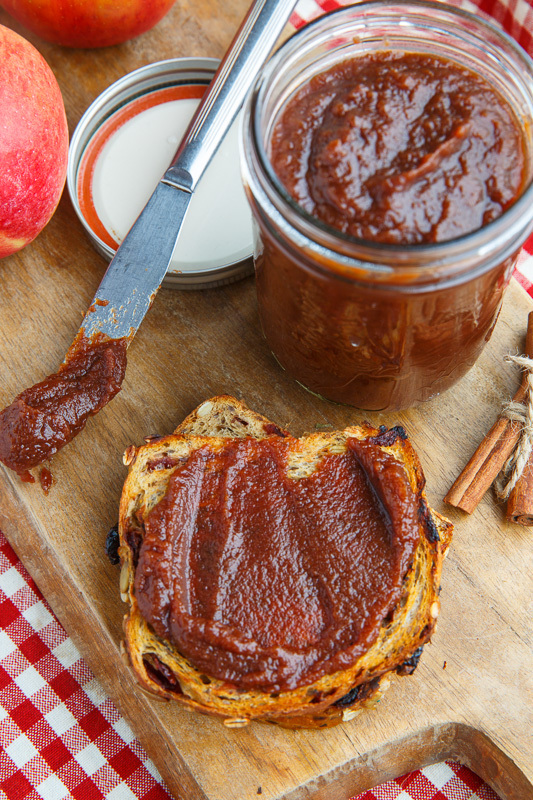 Apple butter is pretty easy to make but when making it on the stove top it requires some attention and so the slow cooker is a great alternative as you can place the apples into the slow cooker and let them go, unattended! You just cook the apples in the slow cooker until tender, puree them and then crank up the heat, remove the lid from the slow cooker and cook until the apple sauce has reduced to a nice thick ‘butter’. This intensity of the apple flavour in the apple butter also makes it perfect for adding apple flavour to other recipes including quick breads, cookies, soups, etc. Feel free to skip reducing from a sauce to a butter and enjoy a really nice homemade apple sauce! Mix everything, place in a slow cooker and cook, covered, until the apples are nice and tender, about 6-10 hours on low or 2-3 hours on high. Puree the apples with a blender or food processor. Cook in the slow cooker on high, without the lid, until the sauce has thickened to the desired consistency, about 2-3 hours. 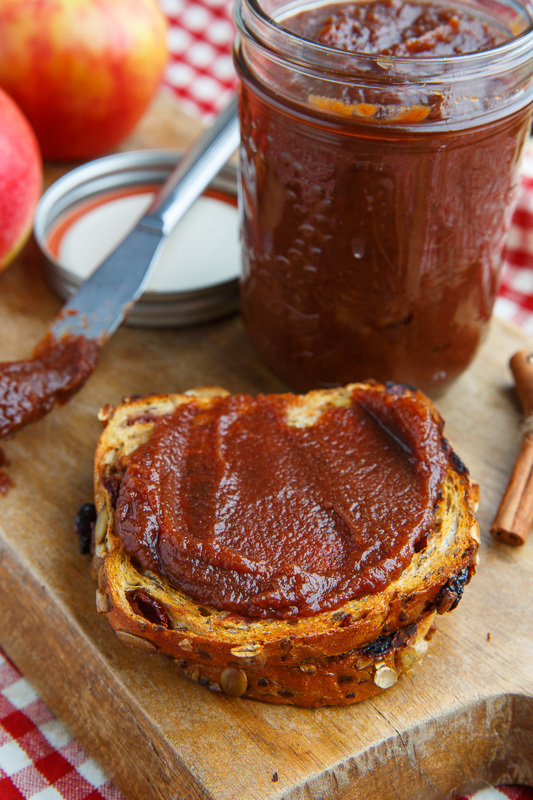 I can think of so many things to spread this delicious apple butter on! This looks awesome, I am going to make this as gifts. Can you tell me what apple works best? Unknown: Any apple works; I like macintosh or honey crisp. This looks incredible! I want it on everything! Hi Kevin, I made this tonight. I used Granny Smith. I also added juice from half a Meyer lemon and omitted the nutmeg. It is sooooo delish! I feel like I really need to make my own apple butter this winter. This looks and sounds delicious! This recipe is absolutely excellent. First time I've made this recipe and it turned out perfect. I highly recommend it to anyone who wants great apple butter. It makes a lot. I’ve frozen mine for over 6 months. Each container was as good as the first. Elizabeth: You can keep this in the fridge for a week or two, or in the freezer for longer. You can also use proper canning process to keep it longer. Enjoy! What would the canning steps be? 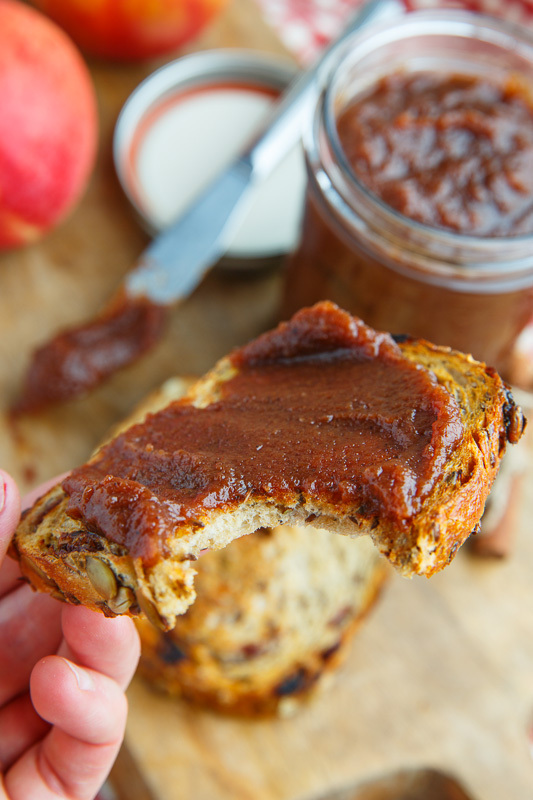 Sara–you can apple butter pretty much the same way you can applesauce. Process jars for 10 minutes in a water bath canner. The time is the same in a pressure canner, but you increase the pressure at higher altitudes. Molly Shores: The lighter colour is perfectly fine! I'm glad you like it! Hi! Are the 3 pounds of apples after they are peeled and cored? This looks delicious, thanks for sharing! I don’t have a food scale- approximately how many apples are in 3 pounds? I usually just grab a 3lb bag of apples; about 6-7 small apples or 5-6 medium or 3-4 large apples. Enjoy! When it comes to apple butter (or really, ANY fruit butter; I do apple, pear, peach and cherry, and occasionally pumpkin), the slow cooker is the ONLY way to go. Don’t bother with the stove; you’ll just burn it.